Marion County is a county located in the state of Iowa. Based on the 2010 census, the population was 33,309. Marion County was created on June 10, 1845. The county seat is Knoxville. The county is named for Francis Marion, The Swamp Fox, a brigadier general from South Carolina in the American Revolutionary War, or a leading pioneer whose name is not recorded. Marion county is named for either Francis Marion, the "Swamp Fox" general of the American Revolutionary War, or a leading pioneer whose name is not recorded. Some say Marion County was named for a pioneer who was a favorite character among early settlers. It could also have been named for Francis Marion, American commander in the Revolutionary War. The popularity of the name is attested by the 17 counties in the US of that name. 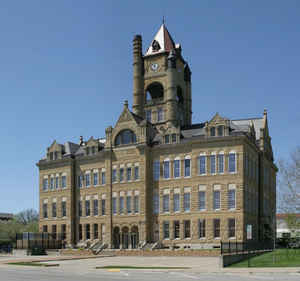 Marion County, Iowa, was formally organized in 1845, and Knoxville was chosen as the county seat. The first courthouse was a log cabin. In 1856, the people became dissatisfied and decided the county was rich enough to have a new courthouse. In 1895 the Board called for a special election to replace the 1856 brick courthouse. Another new courthouse was proposed in the 1960s but was voted down. Instead, updating the old courthouse began in 1972. Today, the beautiful old courthouse has a good sound foundation and an interior full of history. The Iowa flag was designed by Marion County native Dixie Cornell Gebhart. The flag was carried during World War I by local troops and the Iowa Legislature approved it as the state flag on March 29, 1921. In 1996 an open house with period costumes and entertainment was held to honor the 100th birthday of our Courthouse. This celebration coincided with the sesquicentennial of the State of Iowa. As reported by the Census Bureau, the county has a total area of 571 square miles (1,480 km2), of which 555 square miles (1,440 km2) is land and 16 square miles (41 km2) (2.8%) is water. Marion county is located close to the center of Iowa.